Please note that we are not affiliated with any of the restaurants mentioned here. For any queries, please get in touch with the restaurants themselves. Ok, so Philip Larkin’s summary of Christmas dinner is rather extreme, but that’s not to say that feeding everyone is a simple task. If you are the chef in the family, you’re probably very aware that every single person will have a different idea about what constitutes the perfect festive meal. Perhaps you’ve already been inundated with requests – turkey, duck, salmon, vegetarian options, gluten free vegan organic nut roasts, five different types of stuffing, smooth cranberry, lumpy cranberry, no cranberry at all… sound familiar? As a local digital marketing agency, places to eat in Bromley this Christmas has been a hot topic in the office. 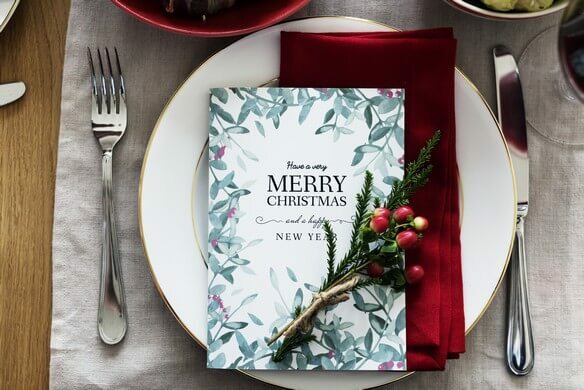 We don’t want you resorting to rock, paper, scissors to decide on your Christmas dinner, so we thought we’d share some of our findings and help you locate that perfect place to dine. We’ve even thrown in some bonus New Year’s Eve options to whet your appetite further. Fancy an authentic Italian Christmas meal? Pierlugi’s have got your covered. Vegetarians can select from the normal a la carte menu as well. Prices: £105 per person for adults, £50 for children. Enjoy a 4-course meal in The Garden Restaurant, with a glass of bubbly thrown in. This one’s great for little ones as it includes a visit from Santa and Christmas presents! Zi’Teresa covers all bases, with options ranging from your traditional turkey to Filetto Di Branzino (sea bass fillet with white wine and lemon). If seafood’s on the menu this Christmas, few do it as well as Sea Salt. Choose sea bass with wilted spinach and creamy saffron sauce, or stick to a more traditional Christmas dinner with all the trimmings. A rich selection of Christmas favourites is on offer at Harpers, including Norfolk turkey, roast beef, monkfish tail and butternut squash wellington. Prices: First sitting (12pm-3pm) – £79.95 per person, second sitting (4.30pm) – £89.95 per person. £39.95 for children under 10. Choose from a variety of options to suit all palettes, including traditional turkey, roast beef, belly of pork, saddle of lamb, roasted cod supreme and pumpkin and goats cheese ravioli. Regans pride themselves on an offering of fresh food and fine wine. You could be enjoying turkey, duck, lamb or a vegetarian option with them this Christmas. Prices: £75 per person, £40 for children under ten. Three courses including tea and coffee. Choose one of Miller & Carter’s flagship succulent steaks for Christmas, or opt for turkey, salmon or a vegetarian option. Complement your meal with fine wines, cocktails or perhaps some Champagne. Prices: £73.95 per person for five courses, including coffee and luxury macaroons to finish. £34.95 for a children’s set menu with four courses. Cow & Pig promise customers they take Christmas very seriously. Choose from a menu of roast turkey, sirloin steak, sea bream, pork shank or mushroom risotto. A good value carvery option for your Christmas dinner. Choose from roast turkey, roast beef with a beef dripping glaze, roast gammon with pomegranate glaze, roast pork with apple and sage glaze or leg of lamb with rosemary. There is also salmon supreme and two vegetarian options. Prices: £52.99 per person, £26.49 for children under 12. Once the Christmas festivities are over and your food has fully digested, there’s only one thing left on the agenda – do it all again for New Year’s Eve! Prices: £45 per person – 8.30pm ’til late with entertainment. Heard of anything else great going on in Bromley this Christmas? Let us know!